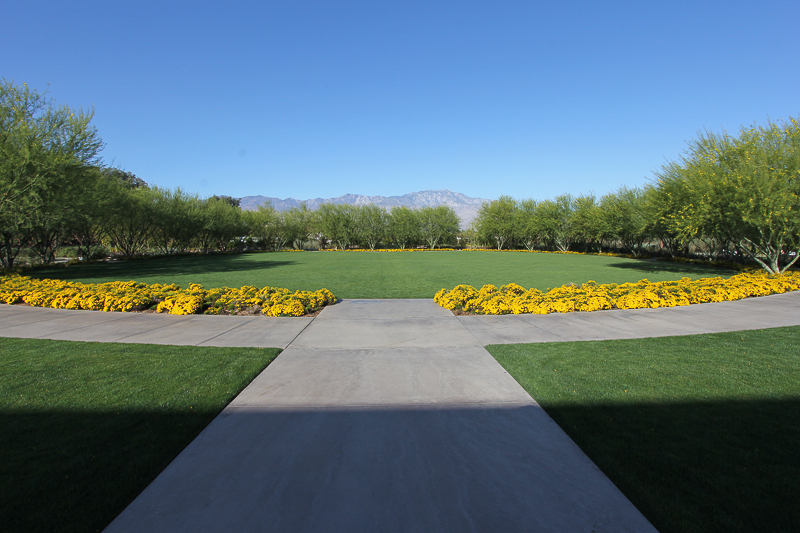 March 15, 2014 - Today we returned to Rancho Mirage, just outside Palm Springs, to tour the former Annenberg estate at Sunnylands. In June of 2013 we toured the Visitor Center and the public gardens, but didn't get to see the main property. The property includes the 25,000 square foot (one bedroom!) 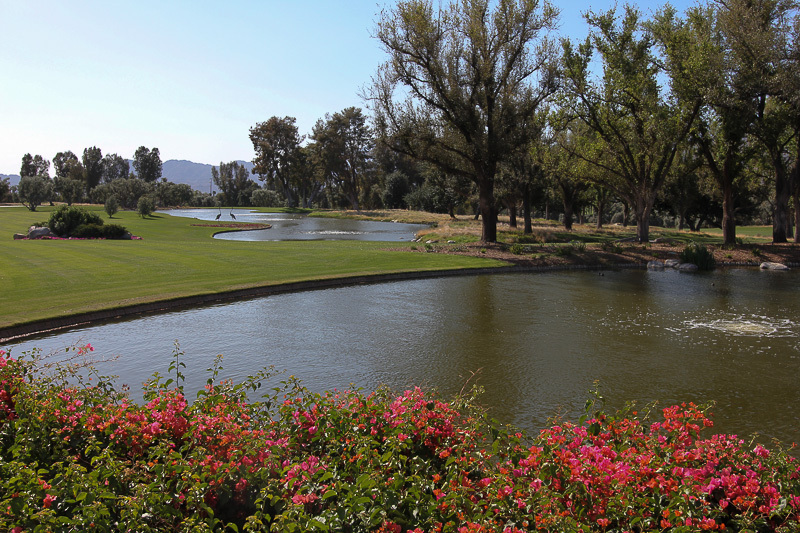 main residence, guest quarters, three guest cottages, a private 9-hole golf course, and 11 man-made lakes. 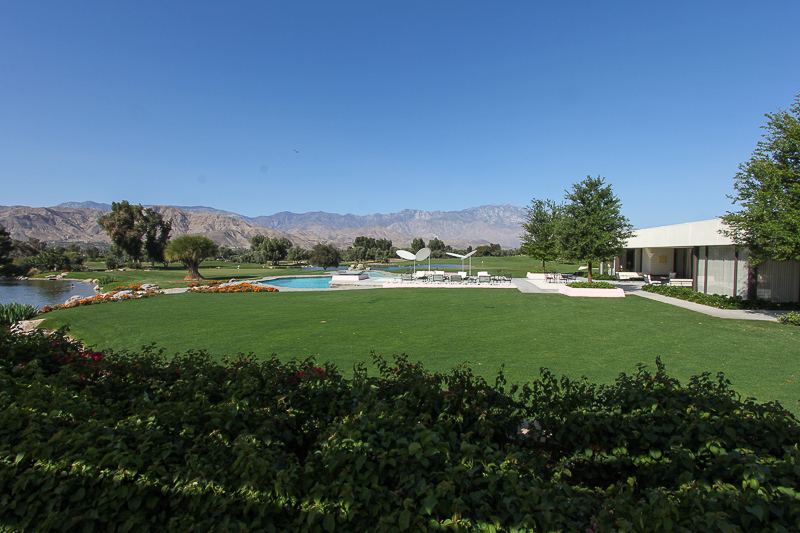 The mid-century modern contemporary home was designed by A. Quincy Jones for Walter and Leonore Annenberg as a winter retreat. 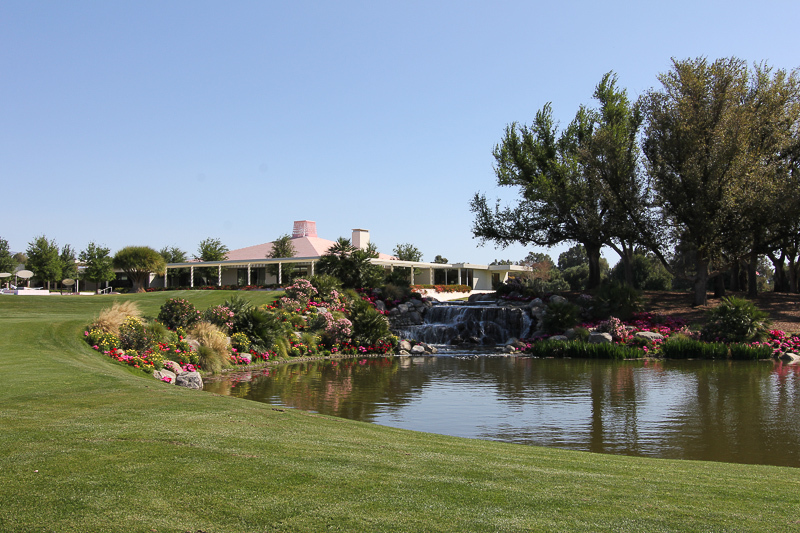 The Annenbergs envisioned Sunnylands becoming a place for national and foreign dignitaries and diplomats to gather for summit meetings and retreats. 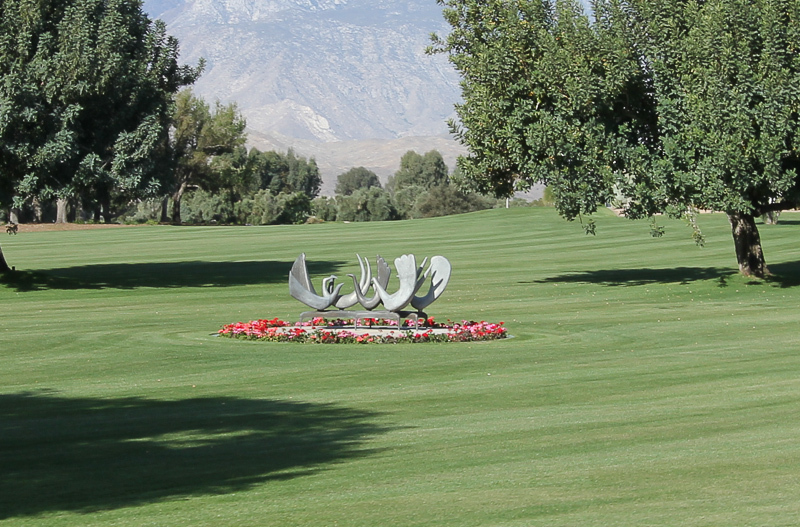 Since its completion in 1966, eight Presidents have stayed here. The grounds of this 200 acre estate are spectacular. 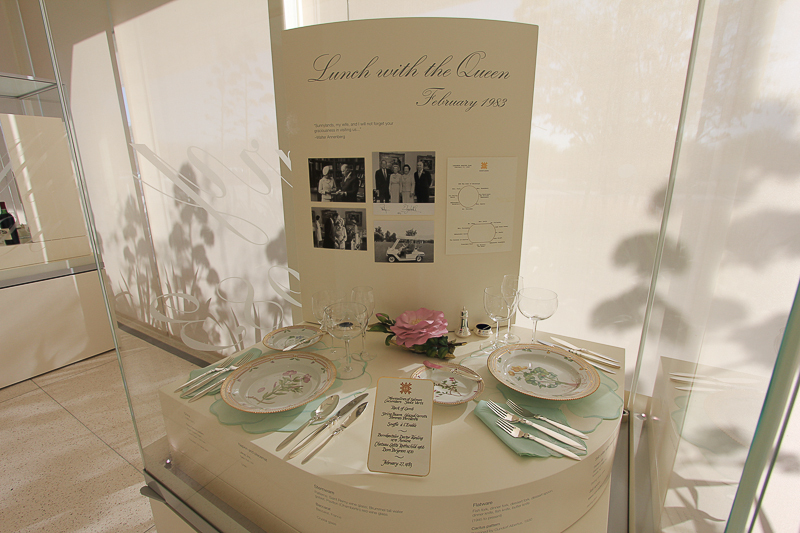 While waiting to begin the ninety minute tour, we saw their temporary exhibit of china and place settings for some of their formal dinners. This is the main house, as seen as we crested over the hill on the primary driveway into the estate. The roof was inspired by a Mayan pyramid and is pink. Leonore (Lee) just loved pink and it's everywhere! There are numerous pieces of sculpture on the grounds, as well as in the home. Forty-five minutes of the tour was spent inside the home. However, for security reasons, no photography was allowed inside. This picture was taken at the front door looking out towards the Mayan fountain and the cul-de-sac drive. 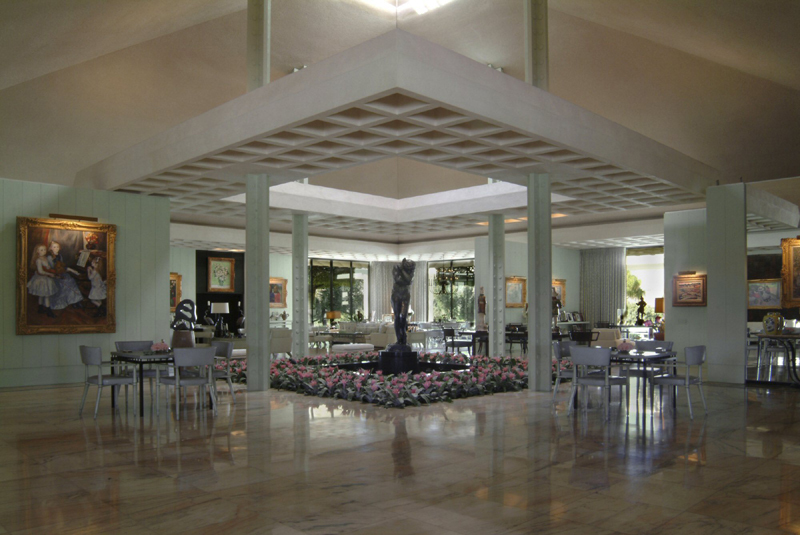 I found this picture of the interior atrium on the Internet. The atrium is the space directly below the pyramid roof. 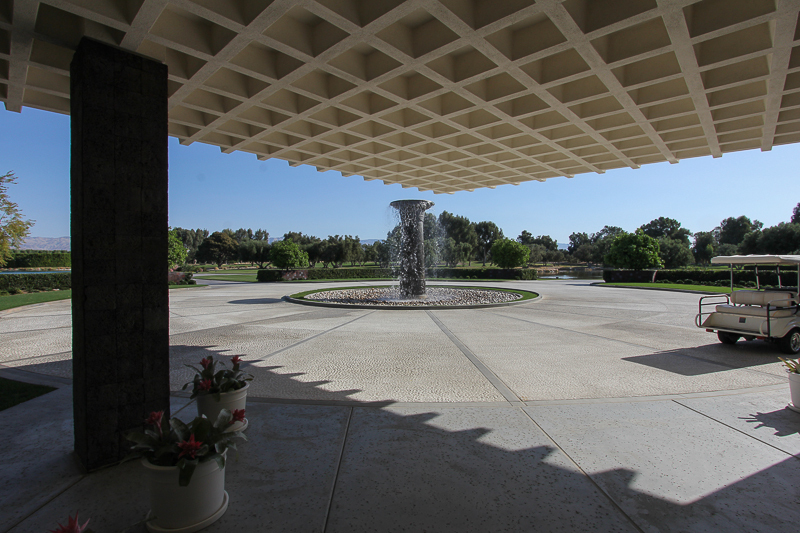 This press photo is by Graydon Wood © January 2012 The Annenberg Foundation Trust at Sunnylands on a page created by Jackie Craven of http://architecture.about.com. The pool area is just outside the guest quarters wing. 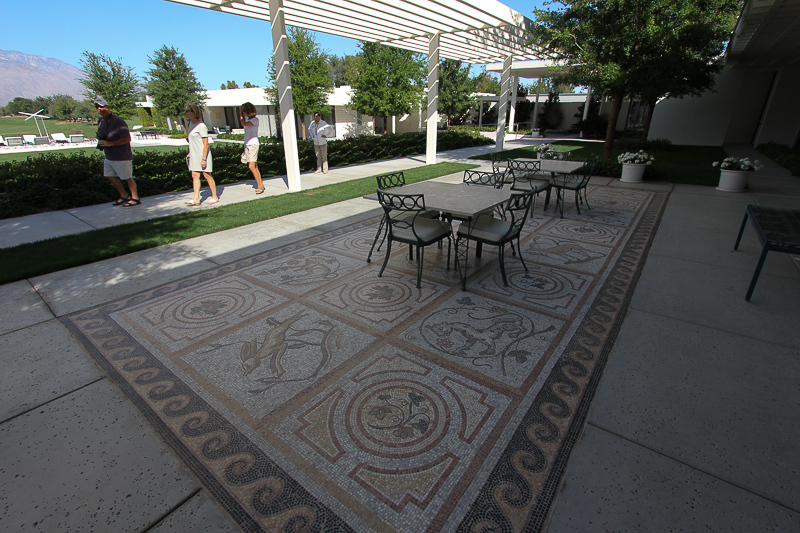 The mosaic floor is a copy of a Roman floor, which mixes well with the pergolas on this side of the home. All of the lakes are stocked with fish to support their ecosystems and for sport. George H. W. Bush reportedly caught 72 fish in one day. However, since he observed the Annenberg's strict "catch and release" policy, it's not known if he was not always catching the same fish. There are over 6,000 trees on the property, and this African palm tree by the pool is unbelievable. 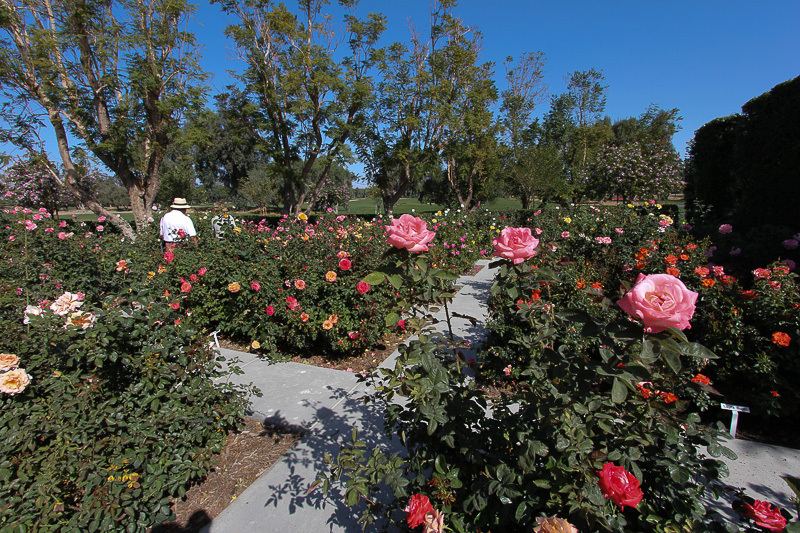 A very large rose garden abuts the home. This is a rear view of the home highlighting one of the many waterfalls on the grounds. 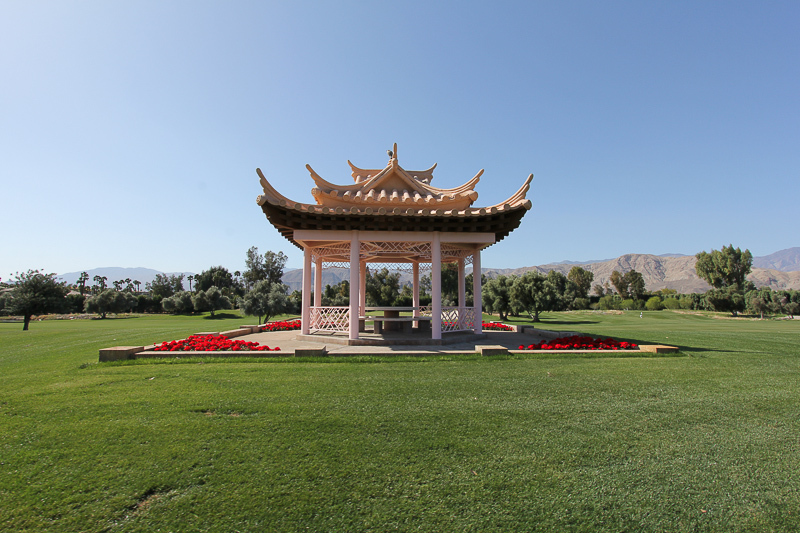 This Chinese pagoda is located on the golf course. It was unfortunate that no interior pictures were allowed, but it was certainly understandable since Obama and King Abdullah II of Jordan were just here three weeks ago. 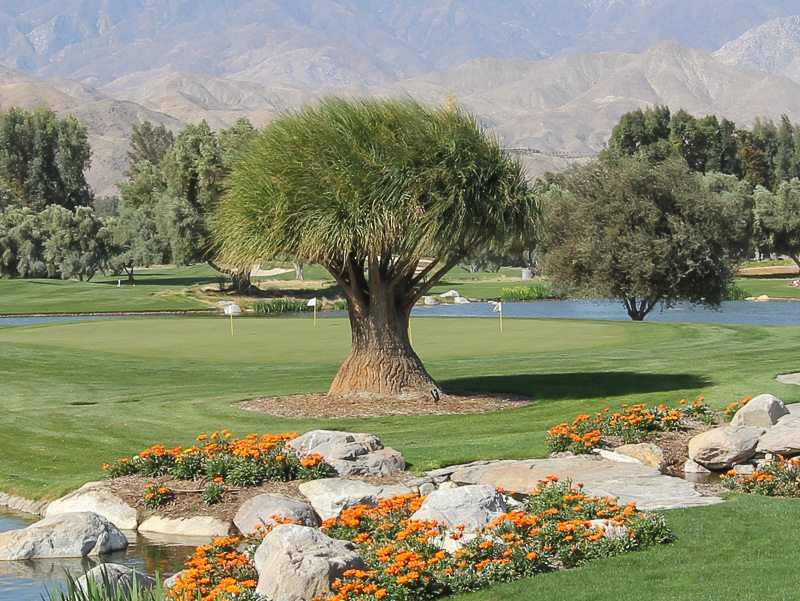 After the tour we drove to Indio for lunch at the Fantasy Springs Resort Casino. At their POM restaurant, Judy had their Waldorf Chicken Salad Sandwich (roast chicken, apple, walnuts, grapes, Dijon mayo on a toasted cranberry-walnut bread) and I had their Spinach Salad (pear, blue cheese, walnuts, toasted sunflower seeds with a bacon-grainy mustard dressing). It was a great way to finish off our day. 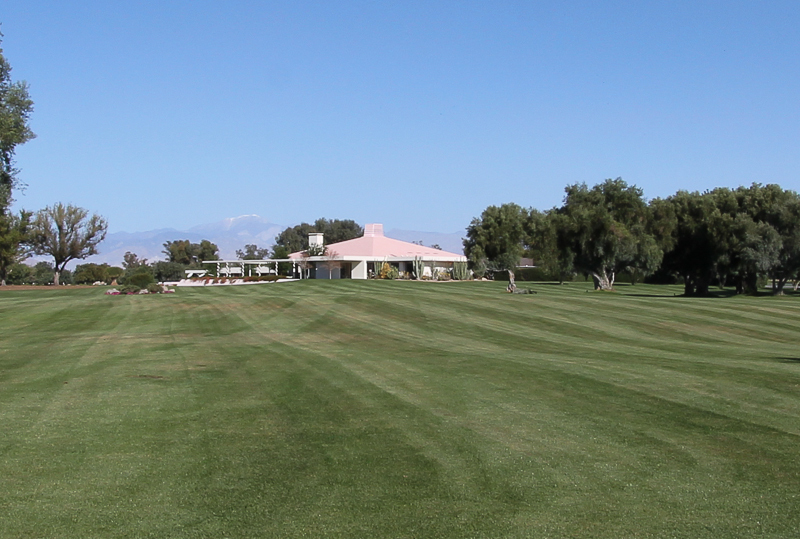 For pictures of our previous visit to the Sunnylands Visitor Center and public gardens, click here.